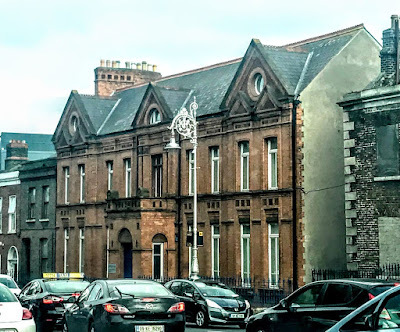 On my way into the Phoenix Park for the opening day of Bloom on Thursday afternoon, I noticed that the former Soldiers’ Institute, close to the junction of Conyngham Road and Parkgate Street, has been renovated in recent years and is now known as Parkgate Hall. This is fine Victorian building was in danger of being lost in recent years. While it was being renovated as offices, the chimneys were removed, leaving a bland skyline. But the building still has some excellent decorative detailing around the windows and main porch. It was built in 1880 to designs by James H Bridgford, with later additions in 1885-1887 by Sir Thomas Drew. The Soldiers’ Homes in Ireland were founded by Elise Sandes (1861-1934), from Tralee, Co Kerry, and Sandes Homes were built in many Irish towns, including Ballincollig and Queenstown (Cobh), Co Cork, Dundalk, Co Louth, Newbridge, Co Kildare, Cahir, Co Tipperary, and at the Curragh. By 1913, there were 31 soldiers’ homes, all close to army barracks; 22 were in Ireland and the rest were in India. Sandes Homes offered soldiers a social space where drink, ‘loose women’ and gambling were prohibited. Every home had a reading room stocked with religious literature. The Sandes Homes tried to provide some semblance of family life for soldiers. The women who ran the homes were known as ‘Mother’ and the were refuges from the barracks life and an alternative the life in garrison towns. The former Soldiers’ Institute on Conyngham Road is a nine-bay, two-storey over basement and with half-dormer attic, dated 1880. There are gables over the paired end bays and a wider central bay, with a single-storey central porch. The walls are built in Flemish bonded brickwork with gauged brick detailing, including a corbelled eaves cornice, raked to the gables, string courses and a chamfered sandstone course over the basement. There are square-headed window openings throughout the building, with ornate gauged brick architrave surrounds rising to foliate panels above the ground floor windows, and pedimented entablatures to the first-floor gable windows. Throughout the building, there are replacement uPVC windows, with moulded bracketed sandstone sills at the ground floor windows, and a continuous sill course on the first floor. There are roundels at the outer gables, and a Diocletian window in the central gable at the attic level. The brick porch has a pierced parapet with round-headed voussoired window openings on either side containing square-headed windows and with a carved sandstone tympanum panel over. The former Soldiers’ Institute was built in 1880 to designs by James H Bridgford and altered in 1885-1887 by Sir Thomas Drew, who removed some of the chimneystacks and raised the attic storey. The Dublin-based architect James Hargrave Bridgford was a son of the painter, Thomas Bridgford, RHA. He was born in Ireland in 1844 and may have trained as an architect in the office of William George Murray at 68 Lower Gardiner Street. He practised from his father’s house at 66 Lower Mount Street from 1874 to 1880, and then moved to 3 Merrion Street Lower. He was in partnership for a period with Robert John Stirling as Bridgford & Stirling, land surveyors and valuers, at 66 Lower Mount Street. He was architect and engineer to the Bray Pavilion Company which was formed in 1878, and lived at No 1 Florence Terrace, Bray. Bridgford’s pupils included Thomas Edward Hudman and George Patrick Sheridan. He moved from the Dublin in the 1880s, and was working in Southampton at the beginning of the 20th century. The architect Sir Thomas Drew (1838-1910) was born in Belfast, a son of the Revd Canon Dr Thomas Drew, ‘a militant Orange’ clergyman who was Rector of Christ Church, Durham Street, Belfast, and later of Loughinisland, Co Down, and Precentor of Down Cathedral. Drew became diocesan architect of the United Dioceses of Down, Connor and Dromore in 1865, but remained Murray’s chief assistant until 1867. Later he practised on his own, although in 1870 he worked closely with William Fogerty before the Limerick-born architect moved to the US. Drew’s pupils and assistants included WDE Butler, John Frederick Fogerty, Daniel J Freeman, Joseph Aloysius Geoghegan, Frederick Hicks, William Sampson Jervois, Charles Hoffe Mitchell, John Mansfield Mitchell, Francis Nolan, Lucius O’Callaghan, Richard Caulfeild Orpen, John Charles Wilmot and probably Harold Edgar Coyle. Drew reached the peak of his career with his design for Saint Anne’s Cathedral, Belfast. He was also the consulting architect for Christ Church Cathedral, Dublin, after its restoration by George Edmund Street, and for Saint Patrick’s Cathedral, Dublin, Saint Patrick’s (Church of Ireland) Cathedral, Armagh, and Saint Columb’s Cathedral, Derry. He was also responsible for the restoration of Christ Church Cathedral, Waterford, and advised on the restoration of the nave pillars in Truro Cathedral. His offices were at 64 Upper Sackville Street (1862), 68 Lower Gardiner Street (1863), 60 Sackville Street Upper (1867-1872), Brunswick Chambers, 6 Saint Stephen’s Green (1873-1888) and 22 Clare Street (1889-1910). He lived at 1 Martello Avenue, Dun Laoghaire (1873-1877), and Gortnadrew, 5 Alma Road, Monkstown (1879-1910). In recognition of her work as a humanitarian and her dedication to the soldiers’ general well-being Elise Sandes is one of only two civilian women to be buried with full military honours – the other being her successor Eva Maguire. Parkgate Hall has become home to Dublin City Council’s Assessment and Placement Service, Homeless Action Team and Housing Allocations service to support homeless people and families. Parkgate Hall also provides offices HSE Mental Health Access, Healthlink, Housing First Project and Focus Ireland’s Family Homeless Action Team. In this way, the services offered to meet people’s accommodation, support, health and mental health needs are all found under one roof. Its present priorities and services, in many ways, means Parkgate Hall on Conyngham Road is meeting the social needs that were at the heart of the values in the foundation of the Soldiers’ Institute in 1880.